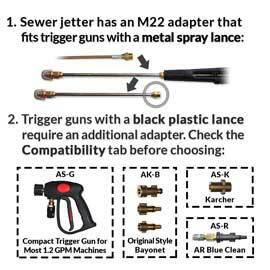 Item SJ-25-M (consists of a J-25-M drain cleaner with an M22 adapter installed, and your choice of electric adapter kit). Shipping Weight (with standard Adapter Kit): 3.1 Lbs. 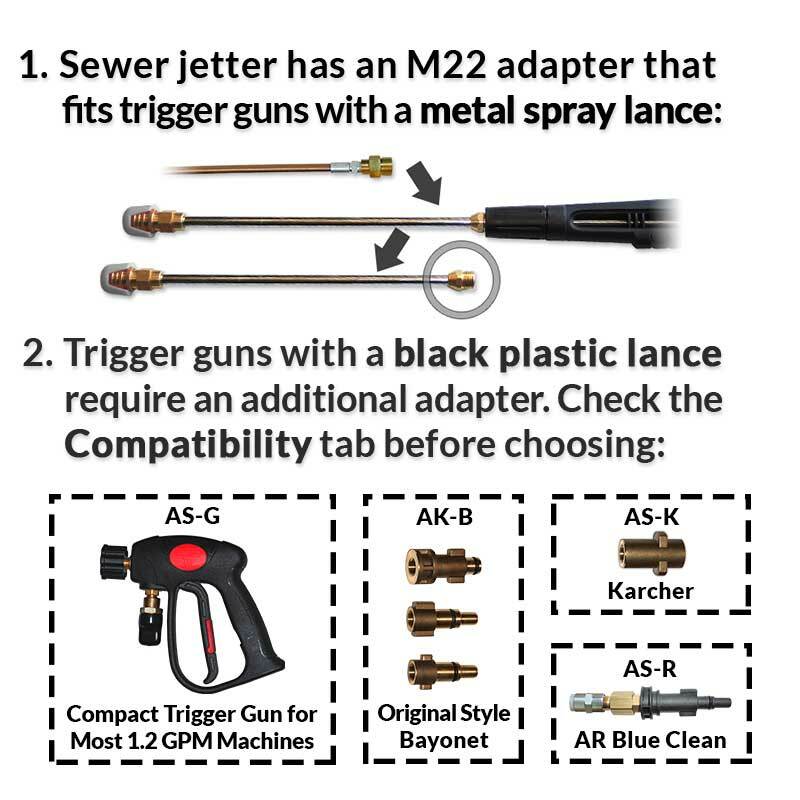 Note: the J-25-M drain cleaner in this set is also compatible with most gas machines rated up to 2.9 GPM when using the M22 adapter that comes installed. This product is great... it self propels like it supposed to, so there’s not much difficulty in unclogging a clogged drain it helped clear years of accumulated blockage within a matter of minutes. Thank you. It has saved me tons of money. Clog Hog to the rescue! Received a call from one of the tenants that the washer drain had flooded and kitchen drain was plugged. Ordered the Clog Hog on Thurs and it was delivered the next day. Hooked it up to my pressure washer and fished the Clog Hog from the clean out into the offending sewer drain. The Clog Hog blasted through the debris within minutes and i almost cried! Moral of the story - the Clog Hog works great, but tell your tenants to not to run citrus rinds down the garbage disposal because 1) it won't make your house smell better and 2) it will definitely clog your drains. Thank goodness for the Clog Hog! If you have a drain snake trash it! My wife likes industrial strength clothes washing machines. My SPEED QUEEN emptys its huge tub in about 1 minute. It overflowed the strand pipe in 2 different houses. Multiple drain snakeings did nothing for it. Clog Hog fixed it in one attempt. I purchased the 25 clog hog to clean out my sump lines, it was the only one that would make a sharp turn down to my basement. The cost of it was a fraction of what it would have been to replace the line. Very good product and would buy again if needed. Not only did it do a great job of cleaning out a sink drain quick and easy, it also did an amazing job blasting all the mud and gunk out of the inside om my Jeep frame. I love this thing. It fits my Ryobi electric pressure washer like a glove, it's been a game changer for power cleaning my French drains. I was thrilled to find this solution and not have to cobble some solution together on my own with random adapters and hoses. It's a bargain for the solution it provides and the problem it solves. I've always hired my tanks to be cleaned and was never satisfied. The guy doing the job just ran the nozzle in and out and that was it. All I got was a $235.00 bill and was never satisfied with the work. I knew that if I could do the cleaning myself I could take my time to insure the tank would be cleaned properly. You can take a chance not doing the job right. 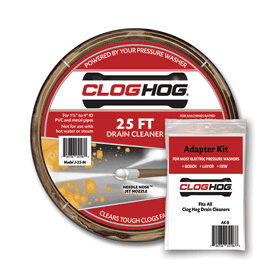 I stumbled on Clog Hog 25 ft. cleaning system. I purchased it early 2018. 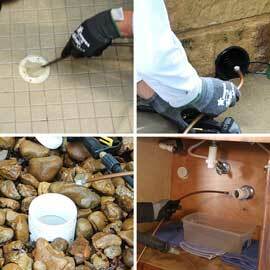 I have used it several times once on my 5th wheel RV and other applications for domestic clogged sewer lines. I took my time reviewing this product to make sure it worked. I am so pleased with it. Follow the instructions closely you'll not be disappointed. The best thing is I can hook it up to my pressure washer that I already had. One good hydro-clean on your RV tanks (black and grey) will pay for this thing. I'm a ex full timer now seasonal RVer. The peace of mind knowing your tanks are clean and not going to plug up next time you dump them is worth the investment. Stuff builds up in those tanks even caused by the use of some tank treatments. Talk to some RVers that have had major tank plug ups. Not that uncommon and can cost big bucks. Stay safe out there. Needle Nose drain Cleaner is better than standard metallic snake because it is self guiding and removes cake up grease at the same time. Very easy to use. It proved I had a break in my outside drain tile. Dave, thank you for your comments. If you think that your drain could have structural problems like a separated, cracked or collapsed pipe you should avoid using any drain cleaner until a licensed plumber inspects the line with a video camera. That's because if a sewer jetter, electric snake, or other drain cleaner gets stuck in a preexisting crack or breach, you could further damage the drain and could have a difficult extraction job. Please contact us before attempting to clean a drain that you think could have preexisting structural damage. We bought this for our science museum to clean out some pipes in our sensory water table and have since clog hogged out pretty much every pipe we can reach. Pulls stuff off the inside of pipes you wouldn't even know is there. Great product!!! I used this on 4" underground drain tiles running off my gutters. The Clog Hog worked great and cleared out all of the dirt blockages. It was easy to use and very effective. Only negative I would say is the price, but relative to renting a drain cleaner or hiring someone to do it, it pays for itself. I recommend this product. I actually used this to clear debris from 3 inch corregated drain tile that was clogged. It took a while but I was able to bring up a lot of debris and clear the blockages. John, thank you for your review. We're glad you were able to clear the drain tile with your electric pressure washer. 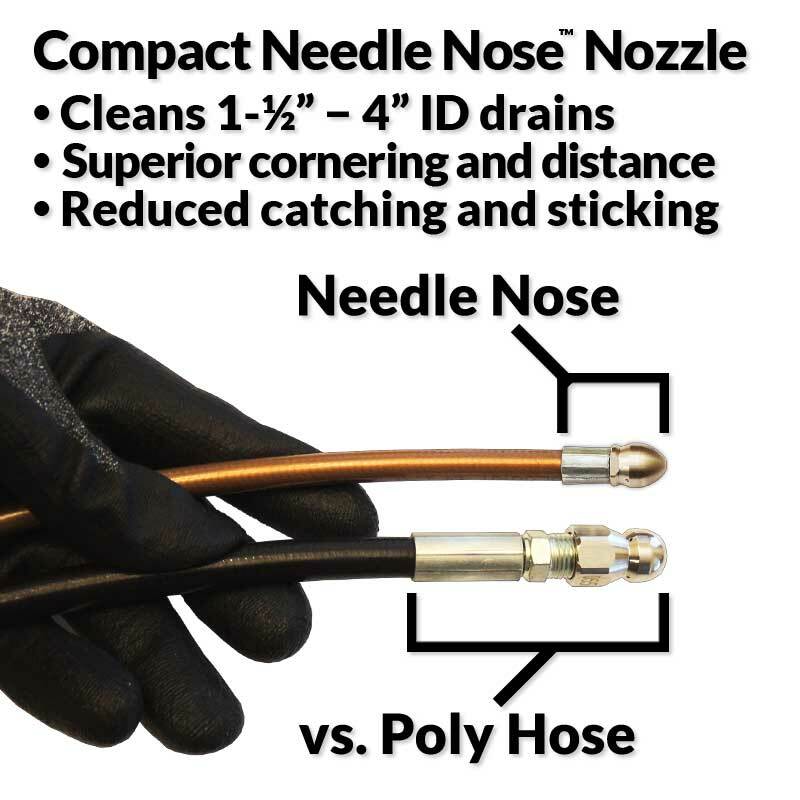 Nozzle force increases roughly with GPM squared, so for much greater pulling, cleaning, and flushing force you can use this same Needle Nose Drain Cleaner with nearly all gas powered pressure washers rated up to 4.0 GPM. Use of a gas powered machine can be a big time saver if you're clearing landscaping drains and footer tiles, since outdoor clogs are typically much heavier and take more force to move than indoor debris like grease and sanitary paper. I run a maintenance department at a retirement community and we are constantly clearing drains, usually hair or goop from bathroom sinks. Using the traditional snake, we have to usually go back frequently. However, after we started using the jetting snake, we have yet to return to any of the drains we have cleared. We like it so much that we are now using it as a pro-active tool instead of a reactive tool. 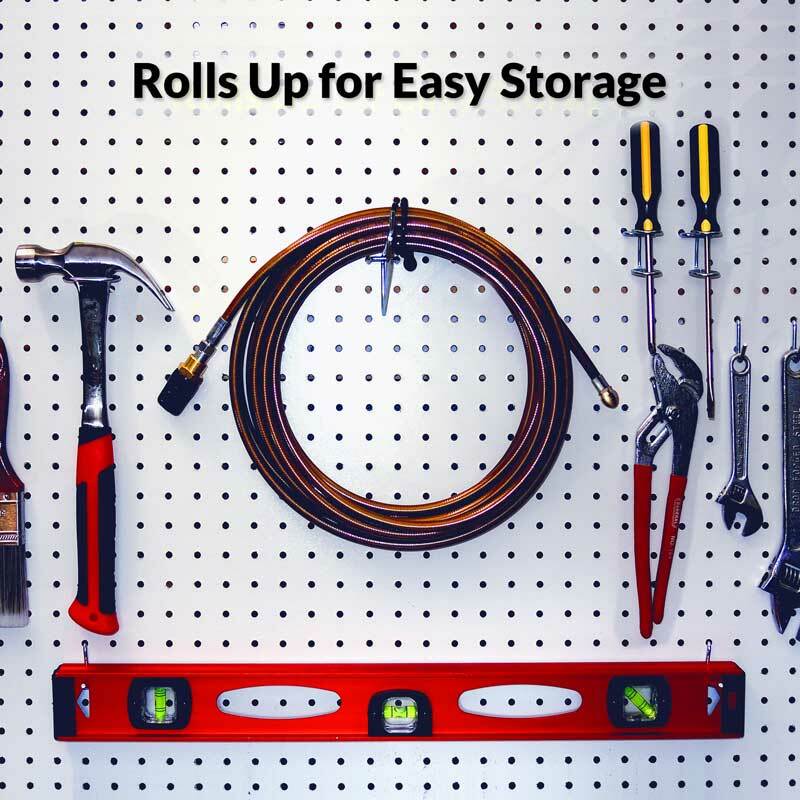 This is a must have for any maintenance person! Got the 25 ft. Unit to clean old drains really fouled up . Now it flows fast and no gurgling noise. Used to flush out 3 inch mains for floor drains that get plugged with sand. Much easier to turn the corners on the smaller lateral drains. Thanks for doing this, Clog Hog. Attached to my Electric power washer and was able to clean the drain from the laundry room. It work very well for me. I did 4 gutters, one may have been clogged, with a little work it went through. It pulled in the line some what by itself and when I pulled it back you could feel it work. Katherine, thank you for your comments. You can use this same drain cleaner with nearly all gas-powered pressure washers rated up to 4.0 GPM. Nozzle force increases roughly with GPM squared, so you'll notice a huge increase in pulling and cleaning force should you attach your drain cleaner to a gas-powered machine. Best of the best. Will come back for more. Thank you. I'm impressed with the ability of the drain cleaner to move past a fairly sharp elbow in 2 inch rusted cast iron laundry drain line with the elbow 31 inches below the indoor cleanout. It went in 15 feet easily and moved some rust flakes back. Good product!! Tom, thank you for your review. You've generally got only about a 50% chance of passing a Needle Nose Drain Cleaner through a laundry drain trap, depending on the design of the trap. It's a good idea to first try other, lower-cost alternatives listed on our How Do I Unclog a Laundry Drain page before you consider trying a sewer jetter. This unit worked great getting in a 1 1/2" sink, drain pipe. The larger Clog Hog that I have would not go through the bends in the drain in the walls. Great tool and does the job well. I only have a 1800psi pressure washer and it cleared this up pretty well. The only thing I can say is if you cant hit the clog from both ends or the down stream end this might not be the product for you. I used it and ended up pushing the junk in my pipes all to the area that was clogged and completely blocked what used to be a slow drain. After finally breaking through and going back and forth in the drain I was able to get it free. So a combination of Clog Hog, plunger, and drain cleaner got me flowing again! It has nothing to do with the product not working and more with just how to get the clog completely cleared by accessing it from both sides of the pipe. Otherwise a great tool, high quality, great staff and support to answer questions. Thank you for your comments. 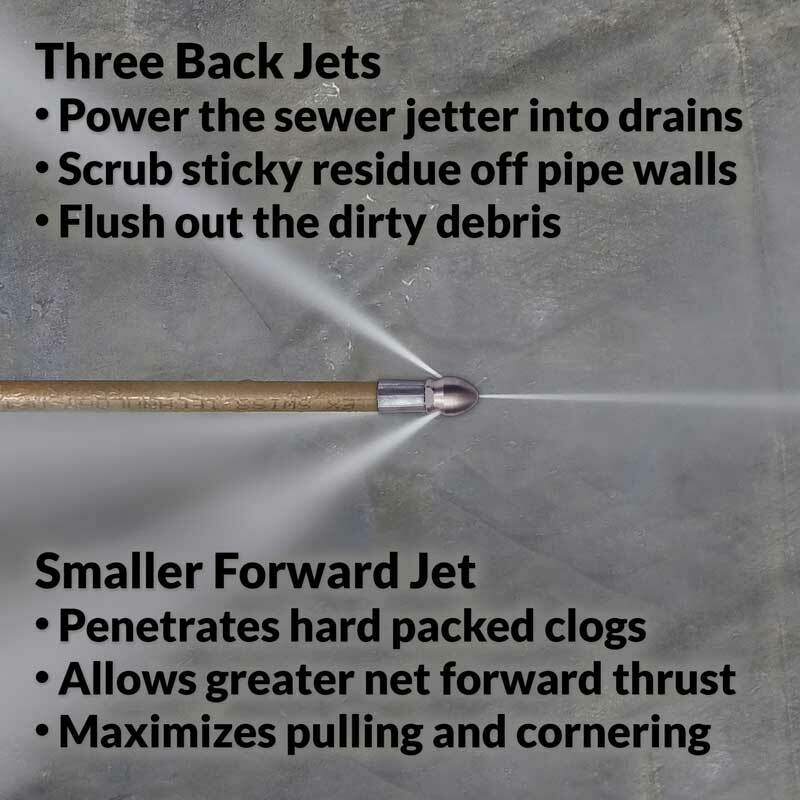 It's unlikely that a sewer jetter could pack a clog closer together, because the nozzle jets work with gravity to break up and carry those materials downstream. However, if you're jetting from an uphill drain opening down toward the clog and the drain is completely clogged, you could temporarily see some water from the sewer jetter flow back out of the drain opening before the clog breaks apart. These spills are usually easy to handle so long as you have a small bucket and a few towels nearby, since you can use your trigger gun to stop the flow of water whenever needed. Excellent product! After having our septic pumped out we used the Clog Hog to clean out the inlet and outlet pipes - first time we had to have it pumped at the home. We weren't sure what to expect with an electric pressure washer but this thing left those crud filled pipes looking brand new, especially the inlet which was pretty gunked up. Ran it from a clean out back to the box also. It fit perfectly on our pressure washer too, which was a big concern initially. The products for gas powered washers must pack a serious punch if this needle nose cleaner can do what it did. 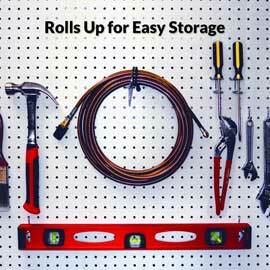 Great product - don't hesitate to order, it'll get the job done. After having my sewer line replaced I wanted to do a deep clean on all the piping under the basement slab. I bought the 50' standard jetter and thought I should buy the Needle Nose jetter at the same time - just in case. 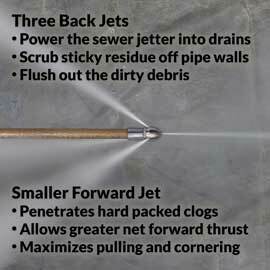 The Needle Nose jetter was a real asset because, even though the sewer lines were wide, there was a lot of construction debris in the old pipes and I had trouble chasing the standard jetter through them - especially around hidden bends. I used the Needle Nose jetter to work these bends out and then I could get the standard jetter through. My feeling is that the Needle Nose jetter might be a bigger asset if you're using an electric power washer like me because the electrics don't have the oompf the gas ones do. In any event, the pipes are way cleaner then they were and the Needle Nose jetter helped a lot. 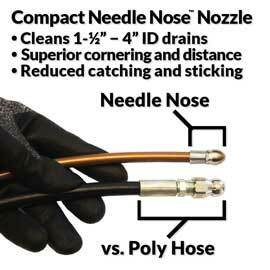 In the spring I'll use the Needle Nose jetter to chase out the kitchen drain and the old vent stacks on the roof. I'm also keen to see how it does on the downspouts. We had a 2" drain line which was plugged from scaled rust sediment, the needle nose Clog Hog was able to pass a 2" 90 degree elbow 8' from the starting point and travel the full 25' length. With multiple passes we were able to remove the blockage and sediment. Reason for 4 star rating, the tip was slightly plugged with a piece of plastic when we received the item and caused us some headache until we figured out the problem, once cleared it worked very well. One drawback is it's only available in 25' length. Mike, thank you for your detailed review. We sometimes hear about small, rubbery chips from pressure washer pump and garden hose seals entering the sewer jetter hose and flowing up to the nozzle, eventually making it necessary to remove the nozzle and shake out this debris. That's why we always recommend that you flush out your garden hose and pressure washer hose with clean water before you attach the sewer jetter. 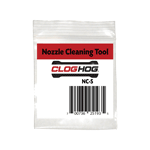 There's detailed information on our FAQ Page about cleaning the nozzle tip. Makes cleaning drains much easier! 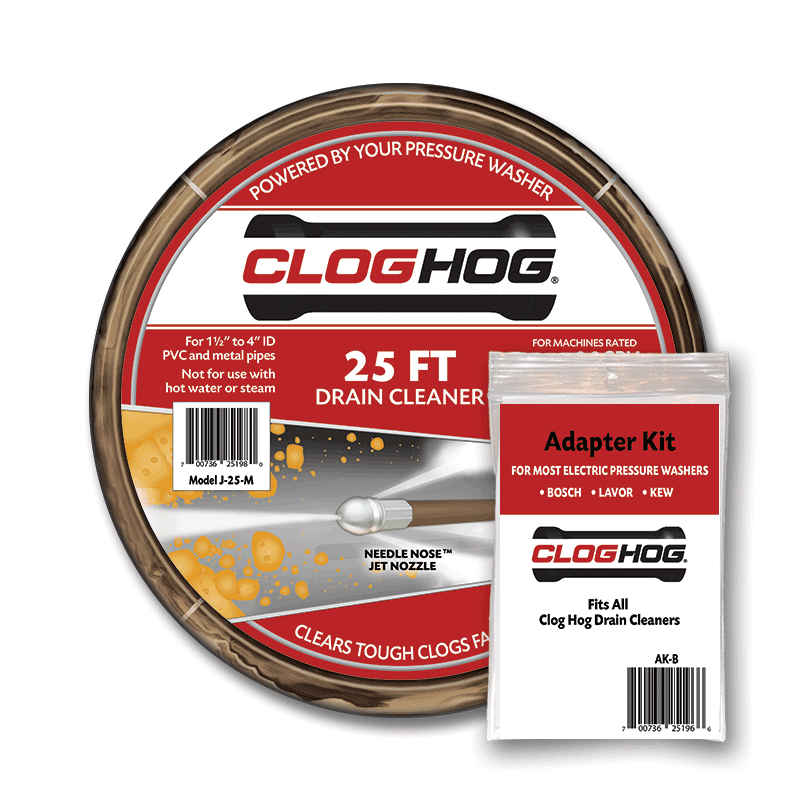 I bought a 25 Ft Needle Nose Drain Cleaner Set and a drain line set from Clog Hog. Can’t thanks enough for their services and products. It worked out perfect with no issues. 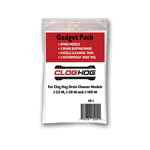 Save so much time and headache with clog drain. I sure will come back for more in the near future. 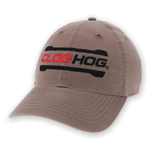 Thanks so much to Clog Hog folks for their professionalism and their awesome products. Highly recommended. I used the Clog Hog in a parking garage drain. This drain was so badly plugged up that two plumbers broke 2 snakes in the drain. They told me I would have to dig up the concrete to get to the blockage. I bought a Clog Hog and cleaned out the drain. Everything works now. Clog Hog saved me a thousands. Thank you for engineering such a wonderful product. Great tool. Was able to get past a tight bend and allow me to finish my project. I was very satisfied with my Clog Hog hose. It worked very well with my electric pressure washer. I used it to clean out my underground gutter drain tile. I was surprised how it just feeds itself once you get it going.